Discussion in 'General Trek Discussion' started by alensatemybuick1, Mar 11, 2017. For decades, Trek references have become almost "de rigueur" for commercials and sitcoms, but what are the earliest examples you can think of (SNL parodies are too easy!). Galileo7 and sumbuddyx like this. I wonder if there were any Spock references in Mission Impossible after Leonard Nimoy joined. Nimoy played Mr. Spock on one of Carol Burnett's sketch comedy shows. I think it was while TOS was still on the air. It was a play on the old Dr. Spock/Mr. Spock mixup, with Burnett as a new mother. I've never seen the sketch, but I've seen a photo from it. I think Nimoy just made a cameo at the end. Lord Garth and sumbuddyx like this. Post-TOS comics abounded with Trek references/homages...especially if Dave Cockrum was involved. Lord Garth, GNDN18, CorporalCaptain and 2 others like this. There was this obscure 1977 film called Star Wars that cribbed some terminology from Trek, in addition to the obvious title homage -- like "deflector shield" and the barely-disguised "proton torpedo," for example. The term "shield" for a force-field barrier dates back to the '30s in SF and "deflector" to the '40s at latest, but the combined term "deflector shield" was pretty much a Trek coinage. There are also "starfleet" and "tractor beam," both terms that date back to the '30s but that '70s audiences (and filmmakers?) would've associated primarily with Star Trek. That was The Secret Lives of Waldo Kitty. I believe they did two "Captain Herc of the Starship Secondprize" episodes, alongside Catman, Catzan, Robin Cat, and the Lone Kitty. Not really -- he was trying very hard to distance himself from Spock in that gig, so as to avoid typecasting (and it may have worked, since he was the only TOS cast member who really had a successful career in the '70s). That's why he took a role that let him play so many different character types. There was one episode, however, where the Saurian brandy bottle prop from TOS was prominently displayed on a shelf next to Nimoy in one scene. It's unclear whether that was a deliberate in-joke, but it sure seems that way. kkt and sumbuddyx like this. Lord Garth, CorporalCaptain and Shaka Zulu like this. ^ The thing that makes me scratch my head about the Legion Cruiser diagram...if the impulse and warp engines are both on the back, what the hell are the exhaust-spewing nacelles for? Maneuvering thrusters? Also, the part about the 1980 Shi'ar Cruiser in your blog reminds me of a bit they did in Amazing Spider-Man #203 (looked it up) around that time...Peter and his friends were at a showing of Star Trek: The Motion Picture when Lightmaster attacked. Well, a car's exhaust pipe is a fair distance from its engine and wheels. Took me a few moments to spot it. Perhaps...but from the diagram details, the nacelles seem to have their own, self-contained mechanism going on. "Wanna be the captain of the Enterprise? Wanna be the king of the Zulus? Let's meet and have a baby now!" SCTV had Mr. Chekov beam into an Anton Chekhov play in an early season, late '70s. They also did a version of "Death of a Salesman" with Dave Thomas as DeForest Kelley doing a Bones performance as Biff Loman. Bay Area DJ, actor and '77 stormtrooper voice Terry McGovern had a 1976 novelty record called "Beam Me Up Scotty." Late Night with David Letterman used to work in a few Star Trek references. When they redecorated the set they had a tribute to the old desk, and showed it being wheeled away, with a voice-over saying, "I have been, and always a shall be, your desk." Chris Elliott had George Takei as the on-camera narrator of his "Late Night Film Festival" short, making bad Trek jokes. Elliott also did a spoof of Shatner's "Rocket Man" on the show, which was really bizarre because maybe 1% of the audience had any idea of what he was parodying. Jay Leno used to have a few Star Trek jokes in his standup, too. Lord Garth, Shaka Zulu, Miss Lemon and 1 other person like this. Shaka Zulu and sumbuddyx like this. McGovern was also the voice of Launchpad McQuack, who was prominent in a 1987 Trek-parody episode of DuckTales called "Where No Duck Has Gone Before." 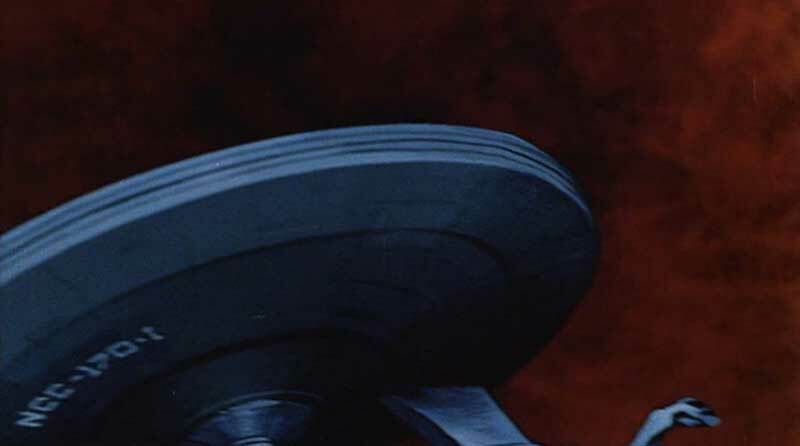 The exterior design of the ship looks loosely like a Klingon bird of prey with a saucer section too. The adventures of the Starchair Enterpoop began in the comic strip "Bloom County" in 1982 - complete with Opus as Mr. Spock and Cutter John as Captain Kirk. Vandervecken, Captain Rob and JonnyQuest037 like this. And the Bloom County characters later made a cameo appearance in DC's Star Trek comic when Peter David was writing the book (A telepathic crew member began broadcasting his thoughts and made the crew see things that weren't there). "Mr. Spock, are you... a penguin?" "Not that I am aware of, sir." This example is late 80s, but was listening to the 80s channel on satellite radio yesterday and Information Society's "What's on Your Mind", which sampled Spock saying "pure energy" (also the subtitle of the song) came on. Mark Goodman, the DJ, explained that Adam Nimoy was a big fan of the group and convinced his father to allow the use of his voice. Presumably Paramount OKed it as well, as I looked it up on Wikipedia and apparently it was a sample from "Errand of Mercy". Supposedly there is also a sample of McCoy saying "It's worked so far, but we're not out yet" from "I Mudd", but somehow I've never managed to notice it. McCoy is the first thing in the song. Maybe it got cut from the radio edit or something. Supposedly that's Shatner/Kirk at the beginning, but it doesn't sound like him. Probably distorted.